Jinn summoning takes time. This is the reality. You can get something in the mirror pretty quick, but if you want more tangible results then you’re going to have to invest serious time and energy. If you’re going to go all in then you want to make sure to use every tool to succeed. The Golden Mean system is a mathematical system based on combining traditional Gematria with the Fibonacci sequence. Yes, it’s a powerful technique of literal kabbalah or ilmu al-hroof. The method was revealed by a jinn during an evocation. Names have power and that is at the heart of magical philosophy. The Golden Mean version of the spirit name basically takes this vibration and brings to a whole new spiritual level. It’s like tugging at their souls. The system is effective for achieving faster responses from all manners of jinn and spirits. It can literally flip the result of the working from maybe to for sure. The Golden Mean as a magical language, whether in Arabic or in English, has a very ethereal and luminous vibration to it. It is the language of the soul vs the mind, which is the closest thing to an angelic language. The Magus Guide to the Golden Mean offers the practicing magician a practical way of integrating this system. 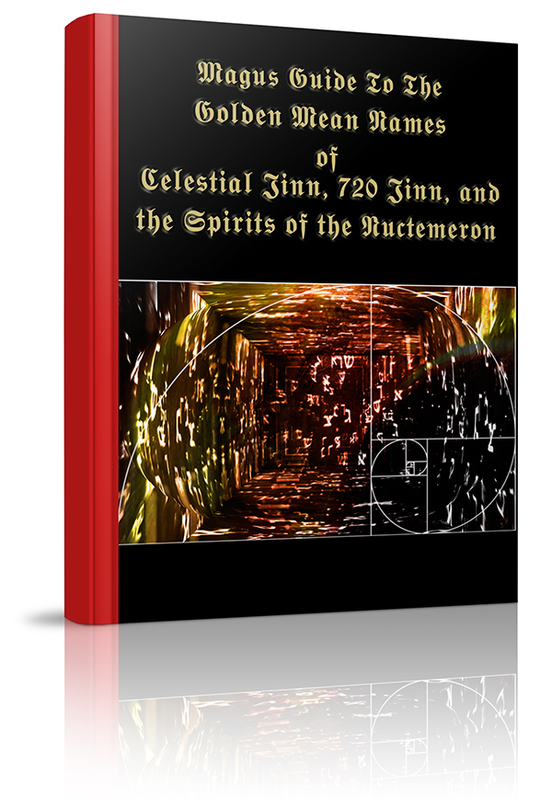 The e-book comes with a list of Golden Mean names for all the 360 Celestial Jinn, one of the increasingly popular methods of jinn evocation due its speed and success. It also comes with a list for the 700 jinn name, which is the same list that contains the jinn that revealed this method. A template evocation is presented in both Golden Mean, English and Arabic, so you can start calling the jinn right away. This is also a must for traditional practitioners of the Western Mystery Tradition. I’ve included the Golden Mean names for the Genii of the hours attributed to Apollonius of Tyana and mentioned by Eliphas Levi. This is one of the least used, but powerful systems, in modern Western magic. Some have complained with difficulty getting results with this system compared to Goetia. No more! You now have the Golden Mean form of the names for these Genii and give it that push. There are no historical evocation for these genii known to date. No problem! I provide you a powerful evocation template that you can integrate into whatever system of magic you’re using. You can kick it to a whole new level by adding the Golden Mean form of the evocation. This potent system is useful for beginners struggling to get results. It is also of great value to adepts who are serious about squeezing the most from their workings.